“Pompeo, who was one of the House’s most consistent anti-Iran voices, was already ‘argu[ing] against the [Iran] deal’ when he took over at the CIA, according to a report in July. The fact that Pompeo was engaging in the administration’s internal debate raises serious questions about the potential politicization of intelligence-gathering and analysis under the Trump administration, echoing the process that led to the false intelligence assessments widely disseminated in the lead-up to the invasion of Iraq. “Pompeo’s appointment as chief spokesperson for U.S. foreign policy makes a virtual certainty that Trump will withdraw the U.S. from the Iran nuclear deal and put the U.S. at odds with its closest European allies. “And Trump’s apparent willingness to accept intelligence briefings alongside political arguments from Pompeo, and potentially from Cotton, shows a new and more welcoming attitude toward neoconservatives and the network of institutions and funders who played central roles in pushing the Iraq war and advocating for confrontation with Iran over the past decade. 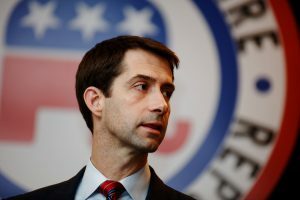 “Cotton is a protégé of neoconservative pundit and Iraq war proponent Bill Kristol. Kristol cultivated Cotton when Cotton was still in the Army, stationed near Washington. ‘Kristol saw a kindred spirt in Cotton’s aggressive national-security hawkishness and the men developed what Kristol describes as a “bond beyond pure policy,”‘ according to a 2014 profile of Cotton in The Atlantic. “That bond extended to Kristol’s Emergency Committee for Israel making $1 million in ad buys supporting Cotton’s 2014 Senate campaign.